President Bashar al-Assad asserted that terrorists are the true tool of the Israeli aggression on Syria and that the terrorists’ acts are more dangerous than Israel’s, therefore confronting Israel requires confronting its tools first. President al-Assad said that if any international envoy were completely impartial, then the west wouldn’t have approved them, and so the biased statements of envoys are part of their role. He also reiterated that any initiative must respect Syria’s sovereignty and territorial integrity, and leave the decision to the Syrian people while prioritizing counterterrorism. “We rely firstly on people, of course after relying on God, but if you don’t have public support then you cannot withstand. If you don’t have public support then there is no value for any political or national direction you adopt as a president or official or state. First, you rely on the people, and second on friends who stand firm alongside Syria and support in the region and in the world,” His Excellency said. When we reach the stage where the countries involved in conspiring on Syria and in shedding Syrian blood stop supporting terrorism, then we can say that we are in the last quarter, because other details that are called a political solution or a political track or anything similar become simple details and of little value, and when we say ‘of little value’ this means that they aren’t essential in resolving the crisis, and they become details on which an agreement can be reached. On how everyone should interpret President al-Assad’s talk of a political solution, President al-Assad said that he doesn’t use the term “political solution” but rather the term “political track,” as the solution is the solution of a problem, and a solution consists of various sides including combating terrorism and a political side based on what was proposed during the beginning of the problem. “It was proposed that the crisis had political causes. This is incorrect. As I said before, the cause is foreign interference, but we went along with all that was proposed. They said the problem is about the constitution, so we amended the constitution. They said the problem is about the laws, so we changed the laws. They said the problem is about the economic track of the state’s economic policies, so we changed many of those policies at that time. We may be wrong, and they may be right, but at the same time we wanted to prove to others that those proposals were untrue,” President al-Assad explained. “But in fact, for this political track to have an effect, it must be between Syrian independent political forces that belong to the Syrian people and have their roots in Syria and Syria alone, unlike what we see now in several of the forces we hold dialogue with that are bound financially and politically to foreign sides,” His Excellency said. On the recent involvement of Oman and the visit paid to it by Deputy Prime Minister, Foreign and Expatriates Minister Walid al-Moallem and how that may be one of the keys for solution, President al-Assad said that Oman has an important role in dealing with various points of tension in the region and cooling them down, leading to a solution, and it’s self-evident that the Foreign Minister’s visit is in the context of resolving the crisis, and it’s also self-evident that the Omani role is to help resolve the crisis. His Excellency said that these meetings aimed to inform the Omani side about the Syrian vision of how to reach a solution, and at the same time they are assessing the regional and international conditions through their relations to achieve a specific thing, adding that it’s still too early to talk about the role Oman could play, as we should wait for this dialogue to proceed to see where things are going. Regarding the repeated Israeli aggressions on Syrian territories that took place recently and how to deal with them, and if the Zionist enemy could create a different status quo in Syria or in the occupied Syrian Golan, President al-Assad said “if we look at Lebanon’s experience during the past few decades, what emboldened Israel against the Lebanese? It was the fact that some of the Lebanese were connected to foreign sides. Some of them were connected to Israel. Some called and begged for foreign interference in its various forms,” stressing that that gave an image and weakness, and thus the Israeli enemy was emboldened against Lebanon. He said that the same thing applies to Syria, as when there are Syrian groups that accept to deal with enemies, whether Israel or other enemies, and call them to interfere in Syria, then this would embolden others against Syria. “Today, the main Israeli tool that is more important than that aggression are the terrorists in Syria, meaning that what they do is much more dangerous than what Israel does from time to time to support them. They are the basis of the problem. So, if we want to confront Israel, first we have to face its tools within Syria. You cannot confront an external enemy when you have an internal enemy. This matter must be resolved within Syria, and then things will be back to the way they were, and no-one would dare act against Syria; not Israel nor anyone else,” President al-Assad asserted. On the evaluation of the work done by UN Special Envoy on Syria Staffan de Mistura, who continues to make accusations against the Syrian state in his statements, President al-Assad said “we’re used to this. It’s difficult for some to come with the approval of the United States and the West for the reason that they’re impartial. If that person was impartial, they wouldn’t have brought that person. Now we see those biased statements. He talks about deaths among terrorists. Of coruse, for them, everyone who is killed is an innocent civilian as if there are no terrorists and as if they aren’t bearing arms. And at the same time, when there are civilian martyrs due to terrorists’ shelling of Damascus or Aleppo or any other area in Syria with rockets, we hear no statements from them. This is the role they’re required to play, and if they don’t, they will have no place, and someone else will come instead. This is the truth. On whether de Mistura has a chance of steering the crisis towards a solution or if he’s just performing a role, President al-Assad said that when the envoy proposed the issue of reconciliation in Aleppo, the Syrian government supported it directly without hesitation, adding that in practice, issues in international relations aren’t based on trust because things change all the time; rather relations are based on mechanisms, and it isn’t an issue of personal relations, because relations among states or with organizations or figures representing states or organizations or the UN, then the relation is based on mechanisms. President al-Assad addressed a question regarding the manipulations of statements in the media, particularly regarding the Russian position, where while Moscow asserts the strength of its relations with Syria and that it hasn’t abandoned it, U.S. President Obama comes up and claims that Russia and Iran believe that the situation isn’t in President al-Assad’s favor, with His Excellency saying that to figure out which is the more correct statement, one must look at the political course or performance of a state. Regarding Russia, the President said that evaluating it requires looking at its behavior for decades, how it treats states, peoples, friends, and opponents, and contrasting that behavior to the behavior of the U.S., at which point one would see where the truth lies. “The United States, throughout its history, has been elusive with its statements, and of course as time went on, this quality for the United States became the basis of policy. This means that what one official says, another official will contradict within days, and what one official says in the morning in a speech or a statement, they will say the opposite on the next day. This is one of the qualities of U.S. policies; abandoning allies, abandoning friends, backstabbing,” he said. His Excellency said that on the other hand, Russia’s policy was never like that, not during the days of the Soviet Union and not now, asserting that Russia’s policy is based on principles and growing more so, and therefore when the Russian Foreign Minister makes several statements and other officials make statements in the same context, it becomes obvious that Russia’s policy is concrete. The President asserted that Russia doesn’t support individuals or a specific president, saying that this would be unacceptable and would constitute interference in internal affairs; rather Russia supports specific principles which are the sovereignty of state and people. On Russian efforts now that Geneva 3 is looming, President al-Assad said “We have great trust in the Russians, and they have proved throughout this crisis for four years now that they are honest and transparent with us in relations and that they are principled. These are important points. So, when they meet various sides, we don’t feel concern that these sides might distort the true image for the Russians. The Russians have close relations with Syria and are capable of finding out about all that is happening accurately. We believe the goal of the Russians is to bring political sides towards dialogue to cut off calls for war. This is the goal, but in the end there won’t be an agreement over anything unless we the Syrians sit with each other and hold dialogue with each other. It won’t be the Russians who impose any solution, so we encourage them to meet all forces and we are relieved when a Russian official meets any figure, without exception. His Excellency went on to say that these meetings seek to pave the way towards either Geneva 3 or Moscow 3, and this naturally depends on the international climate and not just Russia, as there are various forces involved with the United States at their forefront. On whether these forces would go towards Geneva or Moscow, the President said that the difference is that Moscow 3 would work towards finding common denominators and therefore would make Geneva 3 easier and less likely to fail, which would avoid repeating the Geneva 1 and Geneva 2 scenarios that failed to achieve anything. On the principles that set Syria’s position regarding any initiative, President al-Assad said that first among those is Syria’s sovereignty and territorial integrity, and the decision of the Syrian people, which means that there can be no dictations from any side and that any decision must be purely Syrian. “Practically, there must be basis of any initiative, one that begins at and is based on combating terrorism. Any initiative that doesn’t contain an article on fighting terrorism as a priority has no value,” he asserted. He noted that in the last presidential elections, a number of states sent observers in the context of cooperation, not in the context of supervision, and in this context there can be cooperation with friends to assert that what is happening in Syria is a proper and democratic political process. “However, bringing in international organizations… international organizations need certificates of good behavior showing that they are impartial, and they are in no position to give us certificates,” the President added. 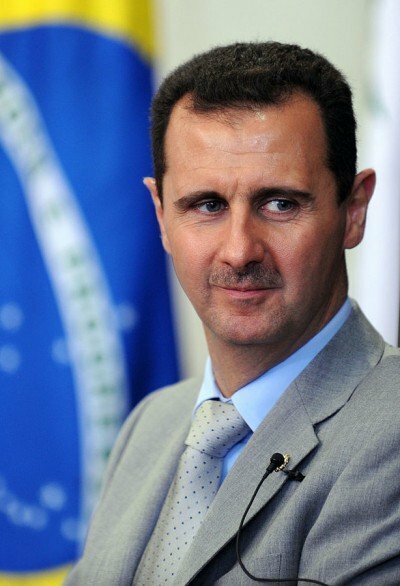 On the relation between the crisis in Syria and the nuclear Iranian deal, and whether Syria could be a victim in this regard or was an offering that provided gains, President al-Assad asserted that Syria is certainly not a victim, simply because it wasn’t a part of the nuclear negotiations, despite the fact that western forces tried to coerce Iran to involve the Syrian issue as a part of the nuclear issue in order to get concessions from Iran regarding its support for Syria, but Iran was adamant and refused this completely, which was a correct, objective, and smart decision. “Was Syria presented as an offering? Certainly not, but we could say that Syria made offerings,” the President elaborated, saying that when one’s allies are strong, that makes you strong, and when they are weakened, you are weakened as well, but saying that Syria’s steadfastness led to the nuclear deal is an oversimplification as the deal is the result of a long process that was started by the Iranian people a long time ago, with Iran withstanding pressure for 12 years and holding fast to its principles throughout the negotiations during the past two years. “In this context, the steadfastness and unity of the Iranian people regarding the nuclear issue are the two most important factors that led to this achievement. As for the Syrian factor, perhaps I can’t be certain; the Iranians are best suited to specify this point, but it could have been one of the contributing factors,” he added. In answer to a question on whether the world is heading toward a new form of coalition, with Syria possibly being closer to a coalition with Iran than with anyone else, President al-Assad said that the alliance between Syria and Iran is 35 years old, and so being allied to Iran and vice versa is nothing new, noting that when Iran was subjected to an unjust war, Syria stood by its side, and now that Syria is subjected to an unjust war, Iran is standing by its side. Regarding the political scene after Syria emerges victorious and Iran’s potential role in it, President al-Assad said that what would change is probably the influence of the Syrian-Iranian alliance on the international arena, because Iran now has more prospects to play a bigger role in it, and Iran’s strength will strengthen Syria, and in the same way Syria’s victory will be a victory for Iran. His Excellency said that Syria and Iran share viewpoints and have mutual principles, and they form the axis of resistance, and so the principles will not change; only some tactics may change, or maybe some results on the ground. In response to a question on the disillusionment of Syrians over the state of the Arab nation and whether he excuses that feeling, President al-Assad said “Excusing it doesn’t mean that we all pursue that direction. We excuse them because conditions promoted citizens to turn against Arabism, and this is a fact for most citizens. This promoted them to make no distinction between true, genuine Arabism and those who hide behind Arabism while in fact their hearts, minds, sentiments, and interests lie elsewhere that is completely outside the region. This is similar to what has happened in the past, maybe in several areas, but less than before; confusing those who exploit Islam like the Muslim Brotherhood and other extremist and terrorist organizations with true Islam. There was confusion; they believed that all those who use the word Islam or Muslim are true Muslim. This confusion happens constantly. I would like to say to everyone who doubts or confuses the two issues that Arabism is an identity we cannot abandon. You belong to a family, and maybe one person or more from that family would treat you wrong, but even if you change your surname, you will continue to belong to that family in your upbringing, identity, nature, and everything about you. You cannot emerge from the identity. The Arab identity isn’t a choice; to belong to a religion and a nationality is your identity, and when you would reach this point, this is what the enemies want: for us to disavow ourselves of our identity. The essence of the cause now and the wars that are happening isn’t about toppling regimes; rather this is a stage and a tool, nor is it about undermining states and economy. All those are tools. The final goal is undermining the identity, and when we would reach that point preemptively, we will be giving the enemies a free present that precludes their need later for military intervention or for using terrorists. Regarding what the difference is between the presence of Hezbollah fighters in Syria and the other side having foreign fighters, the President said that the difference lies in legitimacy, stressing that Hezbollah entered Syria through agreement with the Syrian state which is the legitimate, elected representative of the Syrian people and is supported by their majority, so the state has the right to invite forces to defend the Syrian people, while the other forces are terrorists who came to murder Syrians and against the will of the people and the state. On the President’s relation with Nasrallah, His Excellency said that this relation is strong and dates back to more than 20 years ago, and any observer can see that this is a relation characterized by honesty and transparency, as Nasrallah is absolutely honest, transparent, principled, and loyal to his principles and his associates and friends to the extreme. When asked about how the Syrian Armed Forces commit to ceasefire orders when they receive them, and who has the decision to uphold a ceasefire on the other side, President al-Assad said that this very issue was discussed with envoys who talked about ceasefire, noting that he rejects this term because ceasefire is between states and armies, not between a state and terrorist groups, so terms like “ceasing operations” or “appeasement” are preferred. “However, we asked envoys the same thing; if you want a ceasefire, then which is the group and who is the leader? Who will commit to you? What are their numbers? They used to say that they estimate the presence of hundreds, or more than a thousand, some said 1,200, groups. Maybe after mergers now they’re in the hundreds. But you make a good point; there is no-one who can vouch for all those groups, although we know that they are subservient to other forces. So, we can’t say that these forces can hold those groups to a decision, because those groups are also involved in acts of robbery, theft, corruption, and immorality, and only commit to decisions when it suits them. Therefore, no group or state or side can make those sides comply with any appeasement or cessation of combat activity, even for a brief time,” the President said. On how Syria can be a part of a coalition to fight terrorism alongside those it accuses of supporting terrorism, President al-Assad said that politics is about achieving goals, and goals must be in the interest of the Syrian people, so any alliance or act or step or dialogue that leads to stopping the shedding of Syrian blood must be a priority and must be pursued without hesitation. “What concerns us is the result on the ground. Logically, as you said, it’s impossible for states that supported terrorism to fight terrorism, but there remains a slight chance that those states want to atone or they realized that they were moving in the wrong direction, or maybe they have purely self-serving reasons and are worried over terrorism spreading to their countries, so they decided to fight terrorism. So, there is no objection. What matters is to manage to form an alliance that fights terrorism. The Syrian Foreign Minister said this would be a miracle… but what if it happened? Would we reject it? Of course we wouldn’t reject it, we would pursue it,” His Excellency said. On the escalation by Saudi Arabia against Syria, specifically the statements of the Saudi Foreign Minister following reports of Syrian-Saudi meetings, President al-Assad said that media escalation is of no concern, as what matters is actual practices of states, so when a state supports terrorism, then what value does media escalation or media appeasement have? “Would one expect them discourse that is moral, objective, has a political dimension, or is wise? We shouldn’t expect any of those. If we do expect that, then the problem lies with us, not with them,” he said. On the President’s statements in his last speech on opposition and how some observers said the opposition is treated as an incidental situation and not a deep-rooted situation capable of influencing public opinion, His Excellency reiterated that if dialogue is to produce results, it must be among patriotic Syrians whose roots are in Syria. “But in dealing with reality, the most important question is who has influence? Meaning that if we hold an in-depth dialogue with patriotic figures that have no influence, and we reached results and said let’s apply these results and they say we have no influence on the ground, then what good is that dialogue? We would be wasting time,” he said. President al-Assad stressed that dialogue must be with patriotic and influential figures, and while some have various levels of influence, the major problem is that most of those with whom dialogue is held aren’t patriotic, and this is something imposed by the states that support terrorism and interfere in dialogue, as those states want figures to represent them, not the Syrian people. Therefore, both patriotism and influence on the ground are the essential criteria, especially since terrorists have openly refused to deal with the so-called foreign opposition. If Washington’s training for Syrian opposition figures was embarrassing or confusing to the Syrian accounts or not, President al-Assad said this is an episode in a long series, so if we were to worry, we have to worry about the series… This series is a continued conspiring one against Syria that will not stop at this crisis… this episode, in itself, would not change anything in the context of terrorism in Syria because if it wouldn’t train those, there are other countries that train others and there are other countries which support, send weapons and money… the track of events in Syria wouldn’t stop at this group… there is another thing which is bigger and more dangerous that we would worry about, it is the West’s disregard, on top the US, of the danger of terrorism in the whole region. On the US stance and if it inclines into more strictness or into imposing recognition of fait accompli that wouldn’t come in the interest of the US administration, the President said “strictness or leniency is a feature of the US stance which doesn’t embody the reality of the US policy… strictness or leniency sometimes aims at a psychological war, sometimes sending messages to the lobbies inside the US, so reading those stances wouldn’t give the real image of the US stance. 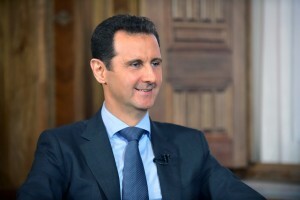 As for the truth about equation being raised that “Syria is in return for Yemen,” President al-Assad said that this is proposed in media, but in reality, we didn’t hear it from any friendly country, like Russia or Iran, and maybe Iran would be more concerned in this issue as it is located in the Gulf, but this issue was not proposed to us. On the Syrian-Egyptian relations and the responsibility of Egypt for the delay of their return, President al-Assad said “We definitely care for the relationship with Egypt…Communication between Syria and Egypt did not break even under Morsi…There are a number of institutions in Egypt that rejected to sever the relations and continued to communicate with Syria, and we listened to national and pan-Arab discourse from them. The President said the relations between “Syria and Egypt are the ones that achieve balance in the Arab arena… Syria believes that it stands in the same trench with the Egyptian army and with the Egyptian people against terrorists” who continuously change their names; taking once the name of Muslim Brotherhood and the name of the Islamic State in Iraq and Syria (ISIS) in other times. Asked about any possible additional measures to ease the Syrian citizens’ living conditions, President al-Assad referred to the reconstruction project that has kicked off and is moving forward with steady steps, referring also to the relaunching of several production projects. “In spite of all conditions, we still have the ability to get the economy to take off gain” no matter how slowly or not much effectively at this stage, said the President, referring also to continued efforts towards administrative reform, combating corruption and providing more financial and tax-related facilitations.